This item will earn you 200 reward point(s). The Blade® Theory™ XL 5" BNF™ Standard race quad is a stretched-X FPV racing drone ready to shout past the competitors, without any structure, tinkering, or tuning needed. The stretched-X style provides outstanding stability in quick forward flight, and the 4mm frame thickness stands up well to crashes… suitable for a racing drone. New 2206-2450kv Thrust® motors and the 30 amp BLHeli ESCs make every maneuver feel smooth and locked-in. The fully-configurable F3 flight controller comes pre-flashed with Betaflight firmware and professionally tuned. A 200mW video transmitter with power switch and 700VTL CMOS camera provide tidy and dependable video in any environment, while remaining friendly to other pilots. 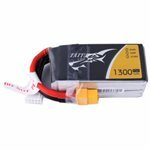 With all the most popular elements in FPV racing, the Theory XL 5" BNF takes the headache out of preparing yourself for a race, just charge and link a FOUR battery, and you will be zooming through gates in no time. Needs a 6+ channel transmitter with Spektrum™ DSM2/DSMX innovation, a LiPo Flight Battery, and charger.